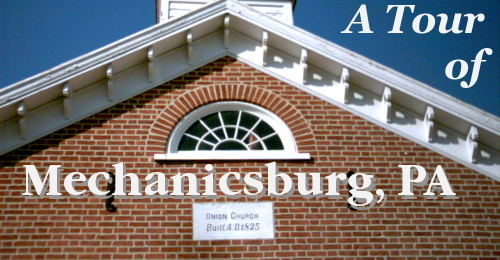 Mechanicsburg was founded in 1822. 02 - 15 Irving Womens College -- Founded 1857, closed 1929. Named for Washington Irving. First womens college in Pennsylvania. Now apartments. 16 - 29 Simpson Ferry Road -- Road established from existing Indian trail about 1792. Mansion built 1836. Road connected the frontier town of Carlisle, now the county seat of Cumberland County, with Simpson's Ferry on the west side of the mile-wide Susquehanna River across from Harris' Ferry, now the site of Harrisburg, Pennsylvania State Capital. 30 - 49 Simpson and Market Street -- Late 1800's Victorian homes some now serving as businesses and apartments. Note filigree decorations and Victorian era color schemes. 50 - 54 1910 era row houses now businesses. 55 - 59 Market and Main -- Corner view of 1880's bank building, now Citizen's Bank. 60 - 74 Walking West on Main Street. Looking across street to North side. Buildings from 1850-1880 or so. 75 - 85 Walking East on Main Street. Sidewalk view in both directions returning to Market Street. 86 - 95 Continuing East on Main Street, now East of Market Street. 96 - 102 Union Church, built 1825, and Washington Fire Hall. Many rural to mid-sized cities in Pennsylvania have volunteer fire departments with only a few full time members and dozens of volunteers. Volunteer firefighters are authorized to have blue lights and sirens on their vehicles. 103 - 106 Some very nice 1890's Victorian homes. 107 - 109 Frankenberger Tavern, established 1801. Original wooden beam construction. Served as a way station for Conestoga wagon trains going west to Carlisle and the frontier. Now a museum. 110 - 113 Decorative entrance and 1880s era homes. Blue building being renovated. Tour continues by returning west toward Market Street traveling on the South side of Main Street. Views buildings covered in 55 - 109 from opposite side of street, looking North. 114 - 116 Frankenberger Tavern from across the street. 117 - 151 Various Civil War (1860's) to Victorian (1880s) era buildings -- Shops, apartments, and homes. Also Union Church and Washington Fire Hall from opposite side of street. 152 Nice shot of First Church of Christ, built 1835, rebuilt 1868. 153 - 156 Former church, now Market Street Art Gallery. 157 Beautiful inlay window in side of Market Street home. Visible in pics 44 and 49. And yes, it was almost Halloween, so that explains some of the silly decorations! Hosted by Tadpole Webworks. We hope you've enjoyed it!